Samsung Galaxy A80 was announced on 10th April 2019 at the event produced by Samsung in Thailand. Most probably it is going to be released in the latter half of May 2019. The feature of rotating camera in this Samsung Galaxy A80 makes it the first of its kind. The upcoming Samsung Galaxy A80 has continued the legacy of Samsung which makes the firsts for the company and the devices in general. The most attracting feature of Samsung Galaxy A80 is that it comes with an all screen display with no built-in front camera. So the question will arise what about the front camera? 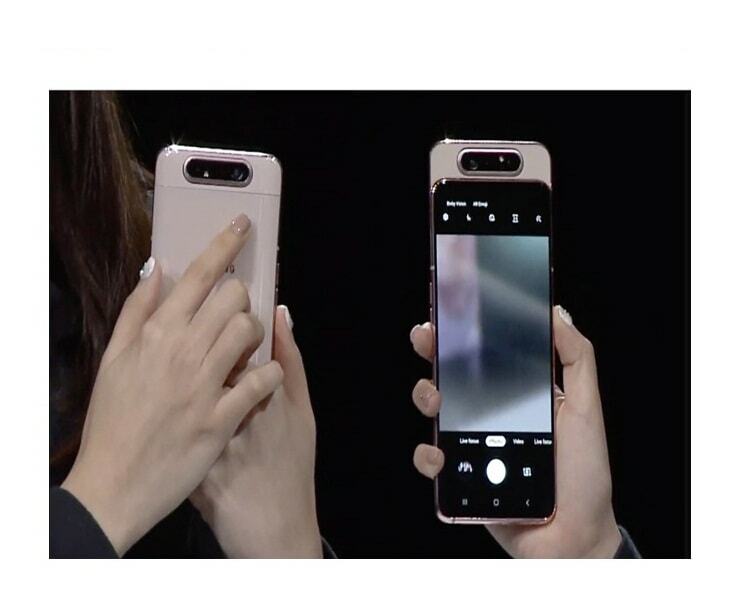 This question can be easily answered as it comes up with the rotating back camera, which automatically becomes the front camera when the front camera is opened. The Samsung A80 is rumored to have a flaunting glass design with a curved back panel and the bottom edge comes with the SIM tray, the USB C type port, and the loudspeaker grill. According to the leaks, the Samsung Galaxy A80 has a 6.7 inches Super AMOLED screen display with a 1080 x 2400 pixels of screen resolution and a 20:9 aspect ratio with no notch. The camera module makes this ‘A’ series model of Samsung one of its kind included with the camera setup of a triple camera including 48-megapixel f/2.0 primary shooter, an 8-megapixel f/2.2 ultra-wide angle lens with a 123-degree field of view, and a 3D ToF sensor. Samsung Galaxy is rumored to be included with the 25w fast charging support and have the battery capacity of 3700mah which is a bit less as compared to its previous models. But Samsung has named its battery as intelligent as it can analyze your daily usage patterns to optimize the phone’s performance and power consumption. Samsung Galaxy A80 is expected to be a gaming Smartphone with a Qualcomm Snapdragon 730G, where ‘G’ is referred to as Gaming. With the aim of improving gaming performance for the upper mid range Smartphone, Samsung has designed a SOC (system on chip). The SOC comes with a 2.2 GHz CPU which can be handled with the help of 8GB RAM available in it and internal storage of 128 GB with no possible option for extendable storage. This upcoming device is coming with the feature of dual SIM and runs on Android Pie with the company’s one UI on top. The price of Samsung Galaxy A80 is expected to be a bit high due to some of its very good features like all screen display, a triple rotating camera, and an intelligent battery which can easily optimize your battery life. According to its leaks, it is expected to be launched at a price of around 50,000INR. At the event the company discloses the different color variants of this Samsung Galaxy A80, it will be coming in Angel Gold, Ghost White and Phantom Black of different color variants with the pearlescent effect available in the first two variants.